Van de Weghe Fine Art is pleased to announce the opening of a second gallery space at 1018 Madison Avenue. Between 78th and 79th Streets, marked by a black-and-white terrazzo sidewalk executed in 1970 by Alexander Calder, 1018 Madison Avenue is a historically land-marked building that has been home to some of New York’s most respected galleries since the 1960s. Van de Weghe’s uptown exhibition program will focus on classical contemporary and Modern art, complementing the Chelsea space at 521 West 23rd Street. The inaugural exhibition at 1018 Madison Avenue will be of paintings by Jean-Michel Basquiat. The gallery has exhibited Basquiat, one of the most significant artists of the post-war period, previously at its Chelsea space with several solo exhibitions, as well as in a show of “Collaboration Paintings” with Andy Warhol. In a single decade, Basquiat secured his place in the history of painting with a singular voice, effectively combining a raw graffiti aesthetic with a multitude of highly personal visual references to anatomy, religion, music, sports, history – especially African American – and language. 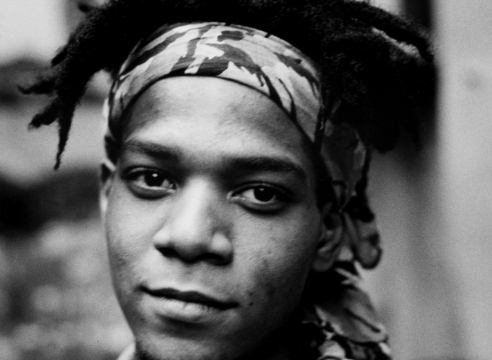 The art world, in New York and internationally, welcomed Basquiat’s unique style and intellectual dynamism and he quickly gained celebrity status from critics and curators while still in his early twenties. Basquiat’s radically distinct approach to painting was defined by his aggressive paint application, strong and uninhibited color choices, graffiti-influenced scrawl and his extraordinary use of language. Bits and pieces of words and phrases, often crossed out or consciously removed through the act of erasure, make for frenzied and challenging paintings with intriguing narratives. The current exhibition brings together a number of important Basquiat canvases, several of which are mounted on visibly-tied wooden supports, rather than on conventionally fabricated stretchers. The frankly handmade stretcher signifies, like Basquiat’s paintings on doors, fences, and other found elements, the passion and immediacy inherent to his process . Each of the works on view also embodies critical elements of the best of Basquiat’s paintings. Busted Atlas 2, 1982, combines his trademark crown with a grotesque and intriguingly fragmented figure, while Black Athlete, 1982, and Red Man One, 1981, are dominated by emotionally charged, full figures with skulls exposed. Hoax, 1983, which makes potent use of text with Xerox collage, and Aopkhes, 1982, make literary and pop cultural references that profoundly inform Basquiat’s work. The viewer gains insight into Baquiat’s psyche; bits and pieces of the artist are exposed in each gesture on the canvas.